Playing a crowded night for indie rockers that included sets from Operators, METZ, Black Lips and Edward Sharpe & the Magnetic Zeroes, Future Islands found themselves before an ample crowd that brought together fans of the North Carolina trio alongside curious viral video watchers and those planted out early to watch headliners Lynyrd Skynyrd later. 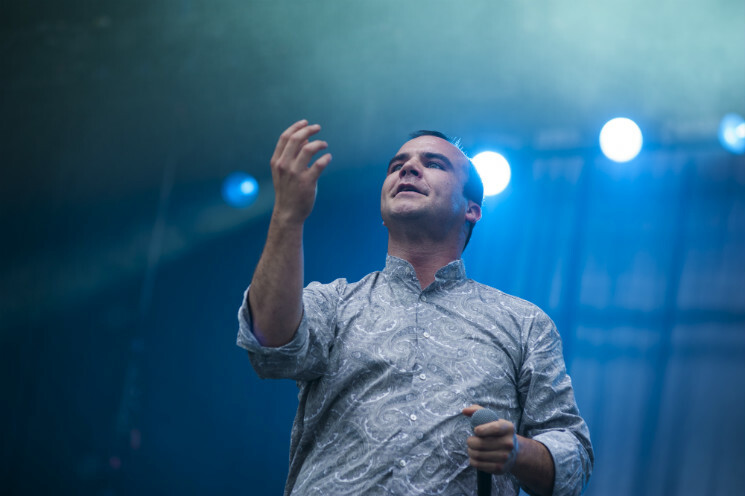 Joined onstage by touring drummer Michael Lowry, Future Islands entered Ottawa Bluesfest's main stage at LeBreton Flats Park looking jovial and gracious, with vocalist Samuel T. Herring expressing how excited they were to share a stage with Skynyrd. Opening the show with "Back in the Tall Grass" and "A Dream of You and Me" from Singles, their latest LP, the band launched into a four-song set of older material, including "Walking Through That Door" and "Balance." Known for his unbridled live presence, Herring absolutely owned the stage during their short performance, delivering passionate miming of his lyrics, intense eye contact with audience members, death metal vocal surges and, of course, his now-famous dancing style. After playing new track "The Chase," alongside Singles' "A Song for Our Grandfathers," high winds and rains ascended upon the Bluesfest grounds, forcing the staff to lower hanging stage speakers and LED screens. After Herring announced that they'd been asked to leave the stage due to weather conditions, they continued to perform, playing crowd pleaser "(Seasons) Waiting on You" before closing their set with a rendition of "Spirits" that found Future Islands and Lynyrd Skynyrd fans raising their arms in unison.